Winter crawls along (but time still flies). Cliff needed to have the propane tank at the shop filled. He and the grandson burn wood to heat it when they have some, but they've used their stockpile. The shop needs heat available because there's always something to be done there, and who wants to freeze to death while they're working on cars or tractors? Heat is only needed when there's actually somebody out there, because even when it's zero outside, the building is so well insulated, it stays above freezing. Anyhow, filling two propane tanks is an expensive proposition... to the tune of over $800. On a positive note, we won't have to buy any more propane, probably, until next November. When the furnace doesn't run, the only appliance in the house that uses propane is the kitchen stove. During winter I crave grapefruits and oranges, but for the past several years the prices on citrus fruit have been outrageous. Throughout the many years my sister was a winter Texan, she would bring back bushels of grapefruits and share them. Placed in the refrigerator, those grapefruits would last for weeks. I'd eat three or four a day sometimes. When I was a child, my mother would cut a grapefruit in half and sprinkle sugar on the halves, but at some point as an adult, I found out I could peel them and eat them with no sugar, and they tasted just fine. My sister finally decided she was getting too old to drive all those miles to and from Mission, Texas, alone, so that ended my grapefruit gluttony. I'd look at the fruits when I grocery-shopped, but couldn't bring myself to pay that much. This year, though, I decided to bite the bullet and spend a dollar apiece for them. After all, some people drink three or four Pepsis or Cokes a day, sugary drinks that really have no redeeming features. Why was I too cheap to buy citrus fruits that are good for me? Now, every time we're at Costco, I buy a bag of huge grapefruits and eat one every day. I'd love to have some good oranges, but so far this year the ones I've purchased have been so sour I can hardly eat them. Arthritis is a strange thing, isn't it? The pain often increases or decreases for no apparent reason. You wake up one day barely able to walk, and think, "Well, I guess this is how it's going to be." Then days later you realize your pain level is less (never totally gone, though) and thank God. I've often heard people say the weather affects their arthritis pain, but I've never thought that applied to me until this past week or two: My leg and knee pain has really increased, as well as the "old Arthur", as Cliff's mom called it, in my hands. I've mentioned this to Cliff, and he's told me his pain has been awful lately, too; he has a lot more arthritis than I do, in more joints. If he lays in bed on his left side, his hip hurts. When he rolls over to his right side, it's his shoulder, which is slightly deformed from years of meat-cutting and butchering. He has a rough time getting comfortable. I'm thankful that I've not had pain that disturbs my sleep (what little sleep I get, all five or six hours). When I'm laying in bed, I'm pain-free. Here's something that occurred to me during my time of increased pain levels: I was limping, and even resorted to taking Tylenol a couple of times, but I have still been enjoying life: Reading good books, watching television shows I enjoy, even walking my dog eight or ten times daily in sub-freezing temperatures limping as I go. Yes, you can be hurting and still enjoy life. Isn't that great? Speaking of dogs, Gabe is doing great, and makes me smile and laugh all the time. He can't get enough snuggling, it seems. Cliff has never cared for dogs living in the house, although I've forced several house dogs on him. But he does like Gabe. He frequently mentions how smart the dog is, and how cute. This is not something he's said about other dogs I've had. 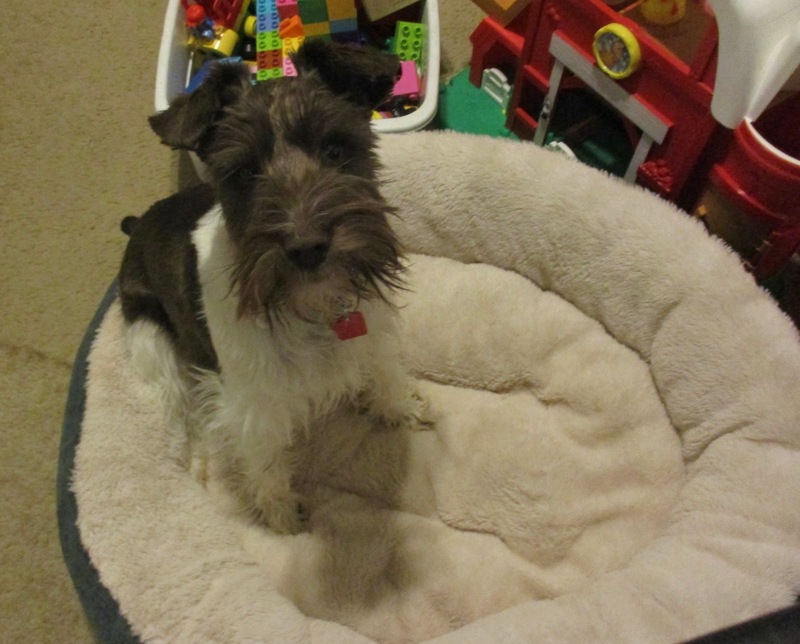 He's especially glad we don't find dog hair all over the place, although "non-shedding" isn't quite accurate, even though Schnauzers are supposed to be non-shedding. When I brush him, the brush will gradually fill up with soft hairs from his undercoat. But you never find more than a random stray hair or two on the furniture. The weather has been so nice lately, I've wished for a tie-out for Gabe, so he could be out enjoying the fresh air and playing with his cat. I'm going to buy one on my next trip to Walmart. My goodness, this entry is a multi-subject ramble, isn't it? Cliff and I talk often about how fast the time zooms past these days. It shouldn't be a surprise to us, since we noticed years ago that the older we get, the faster time flies. But really, now time seems to travel at the speed of light! Even January and February, when the time used to drag, now zoom past until the days are a blur. We fill our little weekly pillboxes up, blink once, and suddenly the week is gone and we're refilling them again. For some reason, my monitor wasn't working over the weekend. There's a plug that gets bumped by a dog or a child and loosened sometimes, disconnecting the monitor. But I checked them all, and later on Cliff did too. For two days, the monitor didn't work, then one day I came in, checked it out, and it was working again. I was going to do an entry Saturday, but all I had was the iPad. Even with a keyboard connected, the iPad is not the best way to update a blog. Sometimes I really wish I'd just gotten another laptop rather than a desktop two years ago; I'd use it more, because I wouldn't have to get out of my chair. Out of curiosity, I looked at refurbished laptops on Ebay and found some really cheap ones from trusted sellers, with a 90-day warranty. I'll remember that next time I'm in the market for a computer, but I'll probably chicken out because they're used. Earlier I was sitting here trying to do this entry with a fifteen-pound Schnauzer on my lap, which doesn't work too well. Gabe has outgrown my lap. He's fine if I'm sitting in an easy chair with padded arms to contain us both, because he'll get partially on me with the rest of his body in the chair beside me. But when I'm sitting in a computer chair, there just isn't room. Also, he sees my fingers moving on the keyboard and paws at them, typing a few letters of his own in the process. We had actually gone three weeks or more without seeing the little girl we babysit; the weather kept her dad from working, for one thing. I told Cliff it's been good for us, because we won't always have her around and we need to be made aware of that. I survived her absence better than he did, I think, because of Gabe, who is like having a toddler around: he keeps me active and alert whether I want to be or not. 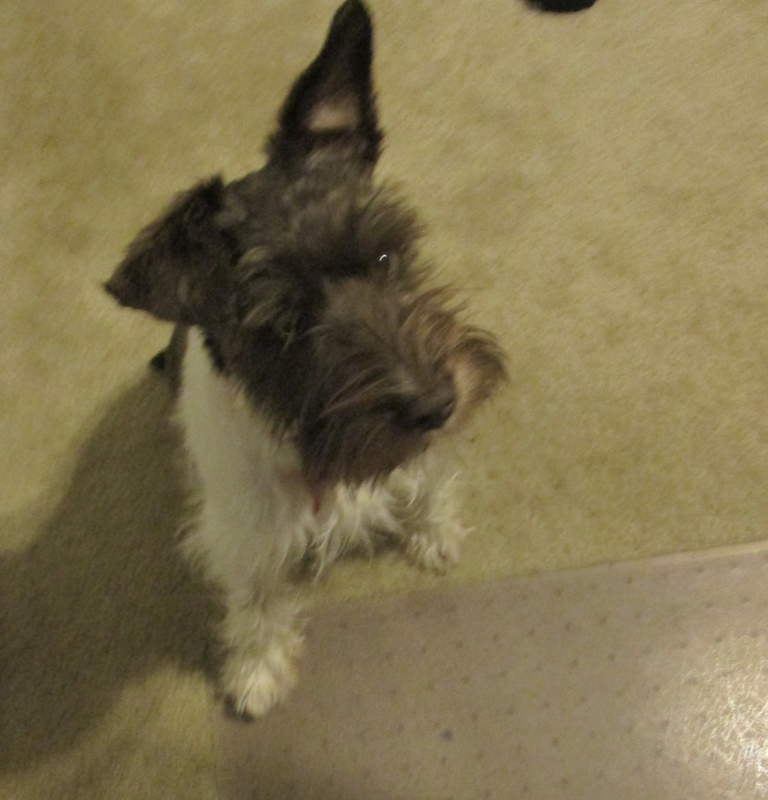 Here are some shots of him in the last half-hour, trying to convince me to let him help me with my blog. He even stands up trying to look me in the eye. Little con man, he is. But he's my buddy. We've survived a lot, he and I. For a couple of weeks there he was puking almost daily, but that no longer happens. Then I thought he was hard to house-break until I finally realized I just needed to pay closer attention. He stands quietly at the door staring at me, and if I miss that signal for too long a time, an accident happens. I'm better tuned to him now and he hasn't had an accident for a long time. I tried letting him sleep beside our bed on a dog bed for a few nights, loose in the house, but woke up to accidents one morning. So now he's back in the pet taxi at night. He really doesn't mind at all; he walks right in there when it's time for bed. When we go somewhere without him, we fence him off in the kitchen with his bed to lie on and some toys, and he's fine after an initial outburst of crying when we walk out the door. Our tractor club is planning an overnight trip in March to the Caterpillar plant in Peoria, Illinois. They were going to go last fall, but couldn't get enough people. Cliff was doing radiation at the time, so we couldn't have gone anyway. Now we're ready to go, if enough folks sign up. It will be a nice getaway. Enjoy your day. All we are assured of is this minute, so take advantage of every second. If all else fails, get a puppy. That'll get your mind off the cares of the world. I made donuts for breakfast. Not really from-scratch, but made from canned biscuits. I imagine everybody knows about this trick: Take the biscuits out of the can, make a hole in the middle, and put them in hot shortening. I use the Fry-Daddy. They're not Krispy Kreme, but they're not bad, especially if you never buy donuts anyhow and they're the only ones you ever have. Take them out of the hot grease when brown, dip in a powdered sugar glaze or a mix of sugar and cinnamon, and eat. This is like a once or twice yearly treat, but when the kids were small I made them often. I read a passage in the Old Testament this morning that reminded me of a sermon I heard years ago. It's the only time I ever saw this particular young man, since he was a guest speaker; but I always remember good sermons. In the passage (Exodus 15:22-27), Moses is leading the Israelites through the wilderness. Three days pass without any water, but finally they find some in a place called Marah, which means bitter. The water was so bitter they couldn't drink it, and they began complaining. Moses throws a piece of wood in the water and it's no longer bitter. There's another sermonette in this, but I won't go into that, because I'm pretty sure nobody comes to my blog for a sermon. The story goes on that when they left Marah, they came to Elim, which had twelve wells of good water and seventy palm trees. When the preacher came to this part, he told us that he and a friend of his, when they fell on hard times, would tell one another, "Elim is coming!" And ever since that time, if things are going bad, I tell myself, "Elim is coming!" Isn't it peculiar that some speaker I only saw that one time impressed me with a story I've never forgotten? OK, moving right along, I'll once more sing the praises of my dog: I'm always up two or three hours ahead of Cliff, so Gabe and I spend a lot of bonding time then. I take him out as soon as he's out of the kennel, then one more time before I wake Cliff. He evidently knows this routine well. I'd taken him out for the second time; he was on my lap this morning when I said, "Get down; it's time to go get Cliff up." He jumped off my lap and ran to the closed bedroom door. When I opened the door, he went around to Cliff's side of the bed and put his paws up on the bed to look at Cliff. Really? He knows what I'm saying? If I ever teach him to bark on command, I'm just going to send HIM to wake Cliff up. I have complained that Gabe is the hardest dog to housebreak I've ever had, but I think the truth is that I sometimes don't see him when he needs out. See, he sits at the front door and stares at me when he wants out. My chair is situated in such a way that my back is toward him when he does this, so he's telling me in his own way that it's time, but I don't know it. Then an accident happens. That's my theory. If only he'd bark to get my attention! I've had several people tell me to put a bell at the door and he will learn to ring the bell when he wants out. Where would I put the bell? On the doorknob? I know it works, because people tell me they've done it. When I first got Gabe and was trying to teach him some basic commands, he refused to come to me when he was loose outside because he was having too much fun. In the house, he'd come. Outside, not so much. I googled everything I could find on the subject and somewhere came across this advice, which I can't quote word for word: If your dog is heading toward danger and you don't yet have him trained to come on command or obey "no", lay on your back, wave your hands and feet in the air, and yelp like a puppy. I tried it in the house and it worked, but who knows what would happen outside; sounded too good to be true. This morning, since the ground is frozen (no mud) and Gabe hasn't been off-leash outside for days, I let him loose and he followed me to tend to the calves. We hadn't been out long when a neighbor's white dog that shows up here a couple times daily came into our yard. Gabe saw him and happily went running toward him. The white dog turned toward home, Gabe following fast. I yelled "Nooooo" loud and long; he stopped and looked back at me, then turned and ran to follow the dog. I could see I probably would have to walk to the neighbor's to retrieve him, because he really wanted to play with that dog. I could see Gabe heading for life on a leash forever. Then I remembered that crazy advice I'd read. It takes me awhile to get down on the ground, but I managed, and then I rolled on my back and began kicking my feet (sort of like peddling a bike), waving my arms in the air, and yelping at the top of my lungs. As soon as I did this, Gabe turned and ran toward me at the speed of light. At the same time, the neighbor lady opened her door and started calling her white dog. So now I know the trick works, but here's my question: What were the neighbors thinking when they saw their 73-year-old neighbor lady laying on the ground kicking and waving and making loud, piercing noises in these single-digit temperatures? Did they think I'd had a heart attack? That's the part that makes me laugh. Let's start with toilet paper, shall we? Seven years ago I became incensed at the high cost of toilet paper. I was also unhappy about the fact that a sheet of toilet paper keeps getting narrower, so we were paying more and getting less. I opened the subject for discussion on my blog, asking my friends which toilet tissue they found to be the cheapest (you can read the entry and comments HERE). After their input, I opted to go with the cheapest recommended brand I could find, which turned out to be Scott. You had to use about 2 yards of it, but I was on a quest to save money. Unfortunately, Cliff got tired of it very quickly and said he'd pay for the toilet paper if I'd just get some decent kind. He was already paying for it, so I shopped around for other cheap brands that might fit his requirements. Possibly too much info here, so beware: I'd been playing this TP frugality game for a couple of months when we went to visit our oldest granddaughter at an apartment she'd just moved into. While there, I needed to use the facilities. Being used to the cheap brands of tissue at home, the kind where you needed to pull off about two yards of paper if you didn't want your fingers to break through it (but it was CHEAP), I was very pleased with whatever it was she had available. Stepping out of the bathroom, I asked her, "What kind of toilet paper is that?" "Charmin Extra Soft," she answered. OK, so I'd buy that wonderful stuff for Cliff and I'd use the Scott in the other bathroom. Everybody would be happy. Yeah... in HIS bathroom everybody would be happy, not in mine. After gravitating to his bathroom more and more, I resolved to start buying Charmin after the cheap stuff was gone. We'd cut corners on something else, by george! You only live once, and at our ages, we'll keep life's simple pleasures as long as we can. It didn't take long to notice a roll of Charmin lasted SO much longer than a roll of Scott that I was spending less in the long run. So even though there are only two of us here, when I saw Costco had $4 off their already decent price on Charmin this month, I bought two huge packs of it (limit 2). Who says you can't learn anything from your grandkids? That's the toilet paper story. I will only mention one item about the Instant Pot. I finally made rice in it: Perfect! However, I had to figure out how much water to use. One source said 1 1/2 cups of water to 1 cup of rice, which seemed strange, because cooking in my double boiler I use a 1/1 ratio. Another source suggested 1 1/4, and yet another, the 1/1 ratio. Part of the problem was that the various kinds of rice cook differently. One source, the one with the 1 1/4 to 1 ratio, said rinse the rice first, drain, then add it to the water. That's the one I chose, and yes, it was perfect. This was the first time I've ever used any button other than "manual" on the cooker. And now, on to a random memory from yesterday. I don't even know what brought this up, but Cliff and I were talking and I jokingly said, in a whiney manner "I'm just an old dirty dishrag. Everybody throws me around and uses me like an old, dirty dish rag." This is not the line of talk you normally hear from me, but I was joking. As soon as I said it, I was immediately sent on a trip down memory lane to the only person from whom I ever heard such a statement: It was the '70's, I suppose. I was working on a conveyor at Whitaker Cable in Lexington. Sometimes one of us would get behind, so the boss might assign someone to be a "rover". This person would go to whichever of the several conveyors might be in trouble, help whoever was behind, and then go wherever else help was needed. One day a lady whose name I can't spell... sounds like Neeawawna... was the rover, keeping things running smoothly. I can't tell you a thing about her, but I remember the unusual name and I can actually picture her perfectly in my mind's eye. The factory wasn't air conditioned and could be as hot as 100 degrees in summer; this lady was doing her job as a rover and stopped near me to help, saying, "I feel like an old dirty dishrag, the way they throw me around." Thanks to one statement she made forty-some-odd years ago, although I really never knew her well, I thought of her yesterday, then told the story to my husband. Now I'm sharing it with the world. Folks, you never know what silly thing you might say that might be the only thing someone recalls about you. Isn't life grand? I wonder if that lady is still alive. As I figured, Sally knew the lady's full name: Neawana Creason. I guess she died several years ago. "She had red hair," Sally said. I do remember that. I can't even imagine why I have such a vivid picture of the woman in my mind, because we didn't really work side-by-side where I'd get to know her. And I can't tell you why I remember exactly what she looked like, and this one silly little story. I'm awful at remembering names; I believe her first name stuck with me because I always wondered if it was an Indian name, and I loved the sound of it. It's a messy day outside, cloudy and drizzly. Some folks say there was black ice on the roads earlier, but I didn't find ice on the sidewalks when I took Gabe out. The temperature is above freezing, the first time in a long time. Our rain gauge has about 4/10 of an inch at present. That would have made a pretty snowfall, but after all the cold we've had, I'm glad it's rain. I've gotten pretty familiar with the Instant Pot lately. We brought our meat home from the butcher shop yesterday and I cooked a package of cube steak in it... unbelievably tender and good! I put in a rack and put sweet potatoes above the meat, but they were very over-cooked after 35 minutes. We ate them, though. The meat probably would have been fine with 25 minutes, too, rather than 35. There's a learning curve with these things. I check recipes online, the cook times and all, but some of them just don't work for me and I have to cook them longer. I am getting attached to the Instant Pot as I learn more about it. I use it once every couple of weeks to make steel-cut oats: I make a four-serving portion and store it in the refrigerator for quick, hot breakfasts. Actually it's five or six portions for us, since we have a smaller portion to allow calories for a piece of buttered toast. This isn't anything like the oatmeal I've always had; you actually have something to chew, instead of something you could drink with a straw. It was inspired by a breakfast I once had at Cracker Barrel. I call it "apple-pie oats". I add a cup of Craisins, 1/4 cup of brown sugar, a teaspoon of cinnamon, and a diced, peeled apple, bring it up to pressure, and cook it for 10 minutes. Then I let it let it release naturally. I still haven't tried the cheesecake recipe in it, because we always have some other sweet thing around. We can't handle two things tempting us at once. It seems we just get over one cold and go right into another one, but I see the same thing is happening to most of my Facebook friends this winter. Tomorrow I'm going to get my eyes tested at Walmart, first time in two years. I'll take that prescription to Costco and get some glasses. We may not do both tomorrow; it depends on whether we have our little girl with us... I rather doubt it, since it's rained all day. That might put her daddy out of work. I ordered the kid a child's camera on Amazon before Christmas. She was SO proud of it, knowing she could take pictures any time she pleased. Unfortunately, it died, wouldn't recharge or anything. I returned it and got my money back, then found an adult camera on Ebay for about the same price. She will be happy to find that waiting for her. I'll have to get a memory card for it tomorrow, though. The one I returned used one of those tiny cards. We still haven't left the place for days, so it will be strange going out tomorrow. I just hope Cliff is up to it. He's slept so much today I finally woke him up and made him check his blood pressure, which turned out to be somewhat high, but not scary-high. If it doesn't go back down soon, I may be forcing him to see the doctor. Gabe is wondering what sort of losers he lives with: I've been busy with one thing and another today (making chili and processing my last turkey frame of the season) and haven't played with him much. Every once in awhile he just HAS to have some action, so he'll grab a toy and run from one end of the house to the other several times, just to get some excitement. And that's it for what's going on at our house! Since I haven't been off the place in a week, you'd think I wouldn't have much to blog about. However, I can always scrape up few ramblings to share. Don't fasten your seat belt, there won't be any excitement. Mama Kitty is still in the mouse-killing business. Apparently she's killed at least two mice and one mole today in this bitter-cold weather. I went out to take a picture of her eating her first mouse (because I'm hard-core like that), but she had it eaten by the time I could bundle up and get out the door. Later she carried a mole up on the porch, played with it for awhile, then began eating it. 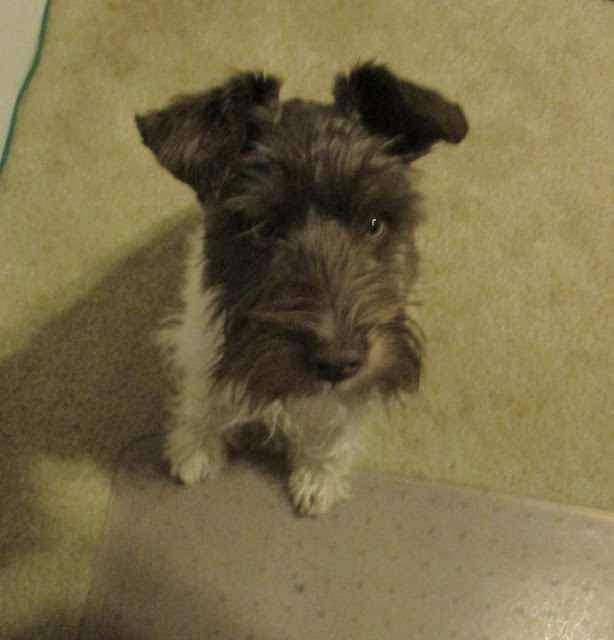 Then a while ago Gabe the Mini-Schnauzer went outside with me; we came back in, I came to the computer, and then heard him munching on something at my feet (when you hear a puppy munching, you must always check it out!). Avert your eyes if you don't want to see mouse parts, this is almost too hard-core even for me! It's the back half of a mouse. Apparently Mamma Kitty couldn't finish her third mouse of the day. This pup would eat anything, and since he's a Schnauzer, I have to wash his beard frequently because you never know what he's been into. I never thought I'd be washing a dog's face! Cliff went to the butcher shop down to road today to watch them cut up our beef. The two halves on the left... that's one of our Holstein steers. Glen Nadler, whose family established this business many years ago. We'll be bringing home the meat after it's been frozen for a couple of days. During the busiest part of deer season, they always stop taking in hogs and cattle and do nothing but deer. Even though they're back to doing livestock, there is still some deer being worked up, Cliff said. I believe I've slipped back into my true hermit mode: I haven't left home in a week and really don't care whether I do or not. I've only seen Cliff and the oldest grandson in that time... oh, and Cliff's brother, who is out in the shop right now; I said a few words to him. Our little girl hasn't been here because her daddy works construction, and it's too cold for him to work. I have read several library books on the iPad: "A Dog's Way Home" by W. Bruce Cameron, "The Forgotten Man" by Robert Crais, and "Coreyography" by Corey Feldman (sad, but it held my interest, which I can't usually say about Hollywood autobiographies). So I'm mostly reading, and cooking when necessary. Gabe hears plenty, though. I talk to him all the time. Cliff, being hard-of-hearing, is always asking, "What did you say?" and I tell him I was just talking to the dog again. Gabe thinks I'm always right, so who better to talk to? I thought for sure I had the flu for a couple of days: I was achy and had a cough, sneezes, and a runny nose, as well as a low-grade temperature. I even threw myself a pity party, but nobody attended. However, today is the third day and although I still have the coughing and sneezing, I feel fine otherwise. I'm pretty sure the flu would have lasted longer and hurt more. I'm thankful all is well here, and I hope my readers can say the same. I awoke around 3:30 this morning, pretty much the normal time for me. Having been a bit under the weather, I decided to take a Day-time Alka-Seltzer Plus first thing. I opened the blister-pak of two and put the two gel-caps on the little table beside my recliner (where I've pretty much spent all my time for two days). 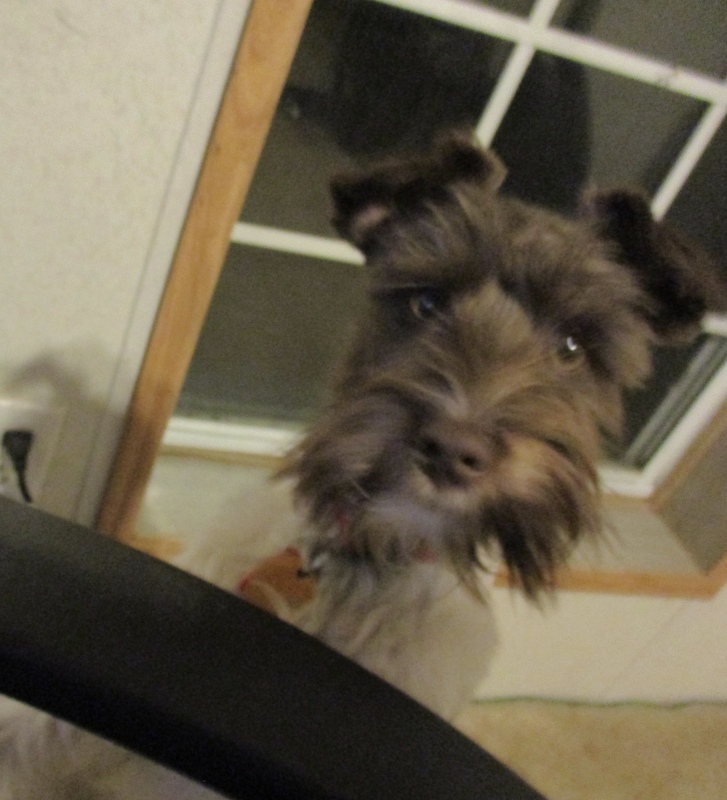 I then got some water, set it beside the gel-caps, sat down, and allowed Gabe-the-Mini-Schnauzer on my lap, where he usually spends the first two or three hours of each day on my lap. I closed my eyes for a couple of seconds, but opened them when I felt Gabe straining toward the table beside us. I opened my eyes while pulling him back and noticed there was only one gel-cap there. Oh no! Had he swallowed a pill that quickly? He eats anything and everything! I got up and checked in and around the chair, even turning the chair over. I double-checked again on the little chair-side table: Nothing. I shook out my clothes and shook the blanket I'd had over me, all to no avail. The active ingredients in these particular pills are acetaminophen, dextromethorpan, and Phenylprine Hydrochloride. The one that worried me most was acetaminophen, since it causes liver failure in an overdose. This 13-pound dog apparently had just swallowed 1/2 an adult human adult's dosage. Google also told me to get the dog to a vet immediately, but of course this would involve my waking Cliff up. He doesn't wake up gracefully, especially for the benefit a dog, It would also involve doing a search for overnight vets and driving to the city. Cliff doesn't drive to the city gracefully, either. Not to mention the amount of money one would have to pay a special animal doctor who stays up all night! However, Gabe has lately been vomiting after he eats and drinks too fast. What if I let him eat and drink all he wanted? That ought to make him regurgitate, right? I totally filled the water bowl and put a very generous portion of his dog food in the other bowl, and the pup was glad to oblige me. He cheerfully ate all the dry food, so I gave him more. He didn't quite make it through that. After half-an-hour he still hadn't vomited, so I got some canned food, positive that would do the trick, since he puked up the last serving I'd given him, at which time I had resolved to never feed him canned food again. He was peacefully snoozing on my lap after eating so much, unaware of the danger he might be in. I'd pat his head thinking pleaseGod, pleaseGod, pleaseGod please let him be all right. Gabe would look up at me and then flop his head back down and sleep. At some point I went to sleep with him still on my lap. At 8:15 I awoke to the sound of Cliff making coffee in the kitchen. Usually Gabe jumps off my lap and runs to greet Cliff when he arises, but this time he slept through it, not giving a sign he even knew Cliff was up. When I told Cliff about my worries, his first question was, "Did you actually see him eat it?" "Well, no," I answered, "but I've looked everywhere it could have possibly fallen." However, when I walked back into the living room I realized there was one place I hadn't checked: the other recliner on the opposite side of the table where I'd placed my pills. I tipped it over and there was the missing gel-cap. Whew! I'll be a lot more careful with pills from now on, let me tell you.